Last yes in December, Gizmodo had a seven day event, on on this particular day, the first 40 people in their 100 limit party to show up got free Nerf blasters. Oh cool is that? This has been out for sometime, but I had no clue this is what they looked like. 2 Goggles, 2 Sharp Shots, and 2 Jerseys for $30 USA. Not bad I must say. Merry Christmas from Basic Nerf! Merry Christmas from Basic Nerf! 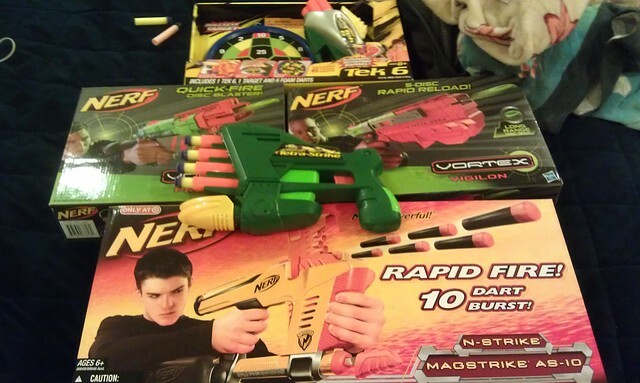 Heres the Nerf related items I got for Christmas, did any of you readers get anything Nerf for Christmas? I’m liking this commercial a lot. The Nerf Vortex line is out now!